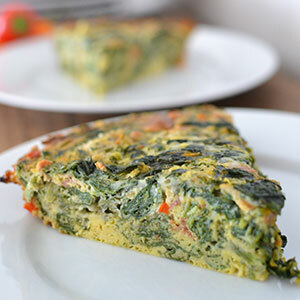 No-Crust Quiche -- Grain-Free, Gluten-Free & Full Of Veggies! Ever heard of Meal Planningitis? It's a condition that overcomes busy mommas wherein they put off and forget meal planning for so long that the question “What's for dinner, Mooooooom?” brings on cold sweats and heart palpitations. It can be mild or severe and last anywhere from 1 or 2 days… to weeks and weeks on end. 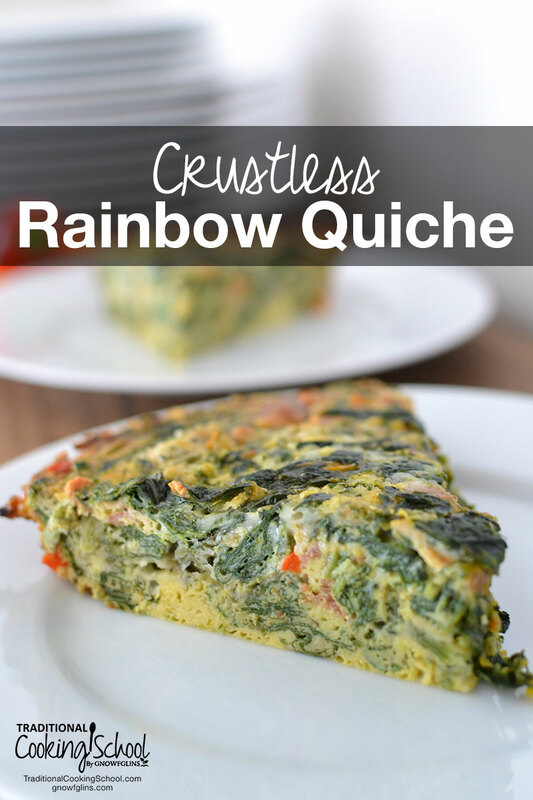 Quiche is one of those meals that I can rely on to get me through any bout of Meal Planningitis because I always have eggs and cheese and an assortment of veggies on hand! Pastured eggs, spinach, asparagus, garlic, raw cheddar, and of course, bacon. Oh, and that no pie crust thing? Yeah, that's on purpose. Quiche is one of those meals that I can rely on to get me through anything because I always have eggs and cheese and an assortment of veggies on hand! This recipe has so many of my favorite foods... Pastured eggs, spinach, asparagus, garlic, raw cheddar, and of course, bacon. Preheat oven to 350 degrees Fahrenheit and lightly grease a 9-inch deep dish pie pan. Remove all the water from the thawed spinach by placing it in a few layers of cheesecloth and squeezing over the sink. Set aside. Heat a cast iron skillet over medium and add chopped bacon. Cook until crisp, then remove to a paper towel-lined plate to drain. Reserve the grease in the pan and add diced onion and asparagus. Sauté 5 to 6 minutes. Then add diced peppers and sauté another 2 to 3 minutes. Remove from heat and add crushed cloves of garlic. Stir well to incorporate. Break eggs into a large mixing bowl and whisk. Add drained spinach, sautéed veggies, salt, and pepper. Stir to evenly distribute all ingredients. Fold in grated cheddar, if using. Bake for 40 to 45 minutes or until center is set. Did you know that a meal plan is emailed to you each week when you're a member of Traditional Cooking School? We take the guesswork out of meal planning altogether! I love to serve a hearty quiche like this for dinner — and then use the leftovers the next morning for a quick, no-effort breakfast. Do you ever get stuck with a bad case of Meal Planningitis? What are your healthy, go-to meals that you can get on the table even when you fail to plan? This post was featured in 41 Exciting Ways To Use Spring Produce and 39 Nourishing Postpartum Freezer Meals To Prepare While You’re Pregnant. Any suggestions on how to adjust the recipe if I can’t include spinach? More asparagus? Some ground beef or shredded chicken? Thanks! Quiche is extremely forgiving. Put whatever you want in the pie plate, cover with the egg mixture and bake! Steam some kale, then throw it into the mix before baking! This is excellent and so easy! Have a grandson due in a neighboring state and have been cooking, baking, freezing to take to them in a large cooler. I’d like to put on the freezer bag how to heat and for how long from the freezer. I didn’t bake in a pie plate, but in a 8×8 Pyrex. Turned out beautiful, but how long to nuke it is something I want to put on the freezer bag, as I have all others. Can you assist and I do NOT want it overcooked and rubbery, like nukes can do to eggs, so am anticipating your suggested expertise.